This may be a week for another sport but it will always be business as usual here at Hoopscritic. With a few weeks away from All Star Weekend, it is a good time to check into the season as we prepare for the playoff push and seeding watch. In case you missed it, don’t forget to check out the Mid-Season Awards by the staff at Hoopscritic. No it is not a storm brewing, or maybe it is? The Thunder are coming together at the right time, poised to make a fight for the 1st or 2nd seed ( currently sit 4 games out of 2nd and 8 games out of first). In fact, it seems their chemistry is coming together as we learned that Russell Westbrook went over to Enes Kanter’s house, ate some Turkish food and destroyed him in video games because what else would Westbrook do besides win? The Thunder struggled in the beginning of the season as they dealt with the return of Durant and a banged up Westbrook. When judging a team in the NBA you have to look at how a team is performing lately and how they are performing when healthy, the Thunder pass this test with flying colors as they are 34-9 with Durant this season. They have arguable the best two man tandem in the league (yes, Golden State would probably trade Klay/Steph for Durant/Westbrook). 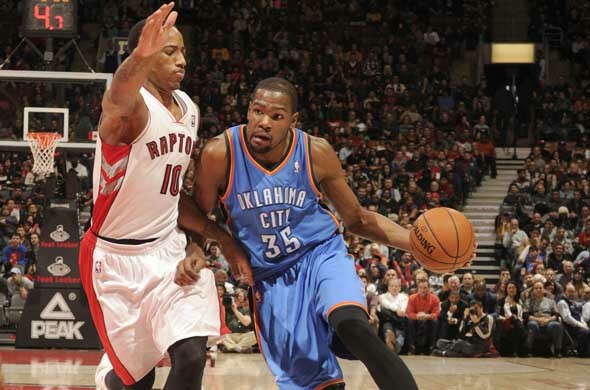 In fact, every team would trade their two best players to get Westbrook and Durant. One thing is for sure, the Thunder could be the healthiest and strongest they’ve been since their 2012 NBA Finals appearance. Finally! A stat for coaches to rank them! Although, this chart is VERY confusing. 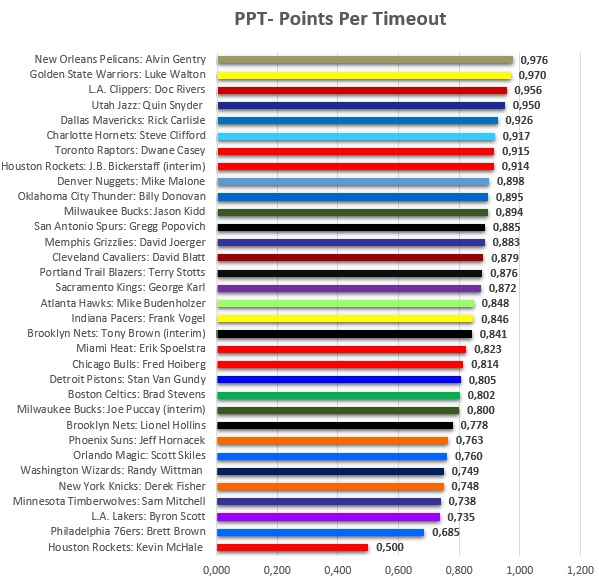 Alvin Gentry might be the worst coach in the league in my opinion, yet here is he doing great time out work. The list does have Doc and Walton near the top which makes sense but having Brad Stevens in the bottom half doesn’t. Anyways, here is the fun chart. Time to Start Taking Raptors Seriously? The Raptors rattled off a franchise record 11 straight wins. They have two all stars. They have seen improvement from almost every facet of the franchise from coaching to players. Lowry and DeRozan were named players of the month for the Eastern Conference. They are hosting the All Star game and are the talk of the town. But should we take the Raptors seriously as Eastern Conference contenders? This answer is still to be determined. On one hand, outside of Cleveland (who is having their own troubles with coaching), there really isn’t another contender. You could see the Raptors playing in the Eastern Conference Finals. On the other hand, they still lack any production from their big men, a problem that will surface when we get to the playoffs and more pressure and defensive focus is placed on Kyle Lowry and DeMar DeRozan. Also, their 32-16 record is pretty similar to this point last year when they were 33-15 coming off a six game winning streak. The downfall with the Raptors is they need to prove it to the league when the playoffs roll around. Until then, they will be overlooked by most. A lot of chatter has occurred since the decision came from the Cavaliers front office (or Lebron but his media posse will deny) that they were relieving David Blatt of his position. Now, if you don’t follow the NBA this is probably just a headline you pass over but rarely in professional sports does a coach take a team to the Finals and have the best record the following year (his second) gets fired. It just doesn’t happen. Now, Lebron’s media (aka Windhorst) was on top of the story as it was getting leaked. Woj from the Vertical put out a damning article regarding the financial implications with the hiring/firing of David Blatt that suggests to ear muff the pro-Lebron stories regarding this situation. Either way, it’s a shame for David who has a long track record of success in every league he has coached in, including the NBA. He was the punching bag when everything didn’t work well and played last year’s playoffs with two of his three stars injured at various times. The man deserves better and hopefully lands another job as a head coach in this league. Another head coach firing, although this one was more justified due to the fact the Suns were regressing under Hornacek. 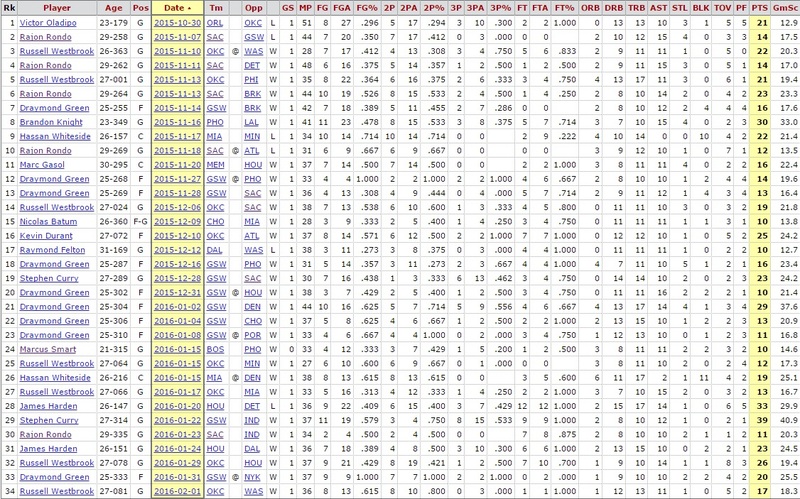 His first year with the team they won 48 games, followed by 39 the next season and were 14-35 this year so far. As General Manager, Ryan McDonough told Arizona Sports 98.7 FM, “The team wasn’t responding to Jeff the way we felt they would.” My only problem with this firing is that the front office hasn’t improved this Suns roster. In fact, they got worse. The head scratcher of a trade, moving Isaiah Thomas (all star point guard) and Goran Dragic for Brandon Knight confused many around the league. Since this trade the Suns are a horrendous 24-53. So really, whose fault is it that the Suns are regressing without any real assets to make a splash for a star? It seems the Godzingas hoopla is starting to die down a little bit giving Karl Anthony Towns the clear front runner, although my mid-season awards had Kristaps as the rookie of the year. Also, don’t rule out Jahlil Okafor, since Ish Smith came to town, Jahlil has been playing much better with a point guard who can actually run plays. It has been a while since I was able to get this column out (bachelor parties, vacations, etc). Since we last met, we welcomed Marcus Smart and James Harden to the group! Also, Hassan Whiteside posted another triple double with blocks and the usual suspects of Westbrook (7) and Green (9) appeared a few more times. Also, the MVP gave us another triple double performance. Man what a great time to be an NBA fan! Only problem with your Westbrook/Durant > Curry/Thompson premise is that Draymond Green is the second best player on the Warriors, and there is no way you trade Curry/Green for the OKC duo.